Are Residential Awnings good Deck Coverings? Do you need a stylish deck cover to complete the look of your newly installed home deck? One of the best deck coverings out there is an awning. What benefits can a gain from a deck covering? Deck coverings are designed to shield decks so you can use your deck how you want to, anytime you want to use your deck. A deck covering will help you control how much sun exposure you want at any given time. A deck cover can also shield you from rainfall while adding additional privacy to your home exterior. What type of awning is best to use as a deck covering? The most popular awning deck cover is a retractable awning. This residential awning can offer you tremendous versatility for your home exterior design and also offer you the option to retract your awning when your deck covering is not in usage. The great thing about retractable awnings is that the retractable awning is available for manual operation or via a remote control. Residential awnings are perfect deck coverings because the awnings can help you maintain a clean deck. Retractable Deck Coverings can offer you full shading no matter if you have a compact deck or a large deck. You can also have a custom awning designed to serve as a partial deck covering. The reason you should have retractable deck coverings installed for your home is to grant you the opportunity to use your deck no matter the time of day. Have you ever been on someone’s deck and having an unpleasant time because the deck got too hot for comfort? You don’t have to go through that. You can keep your deck cool with retractable deck coverings that also protect you from dangerous UV rays. 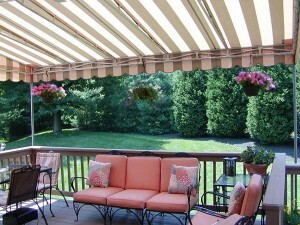 Carroll Awning Company wants you to reap the benefits of custom retractable deck coverings today. All of our awnings are uniquely designed without sacrificing style and durability. Our custom awnings can add an extra touch of luxury to your home design. All you have to do is let our Awning Design Consultants know what you want for your deck design. We offer any type of patio awnings you may need, from freestanding canopies to compact domes. Choose fabrics in stripes, solids or patterns. All are suited for UV resistance. Call for a FREE on-site estimate at 1-800-999-5617 or click here today! Check s out on Facebook and Twitter as well!